Creative Custom Cabinets - hand crafted in the mid-west. Welcome to Creative Custom Cabinets, a family owned business serving the Quad Cities and surrounding area of Iowa and Illinois since 1999. We proudly offer beautiful, hand-crafted Amish cabinetry built by professional Amish craftsmen at an affordable price. With dove-tailed drawer boxes, solid plywood box construction and solid wood doors/drawers, the quality of the cabinetry is unmistakable. There are a variety of options to add, such as pull out wastebaskets, spice racks, adjustable roll out shelves and more, easily making the cabinets customized to fit your needs. We understand how important your home is to you. We are committed to providing personalized services to meet your unique needs. Whether you are building your dream home or remodeling your existing home into your dream, we can help. 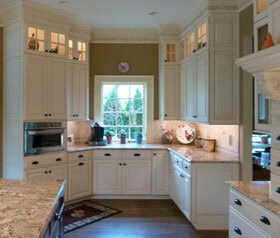 Creative Custom Cabinets specializes in building cabinets with affordable craftsmansip. Click here to see more of our kitchen work. Creative Custom Cabinets specializes in building cabinets with affordable craftsmansip. 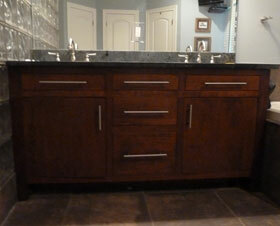 Click here to see our bathroom cabinetry. We also offer cabinets for other rooms. 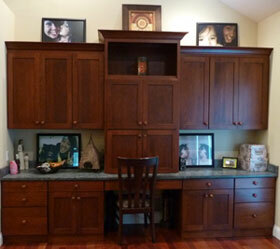 Click here for photos of our other custom cabinetry work.